Jul. 10, 2017 3:00 p.m.
Thousands of hectares of B.C. burning, thousands of people evacuated and thousands of firefighters trying to gain control. Meanwhile, the rest of Canada is watching from around the country. On the ground level, local residents are banding together. The fire has lots of air support including skimmers (pictured), filling out of Watson Lake and water bombers. Bob Grant photos. The fire has lots of air support including skimmers (pictured), filling out of Watson Lake and water bombers. Bob Grant photos. A view of the fire from south of 100 Mile House. Martina Dopf photo. A view of the fire from south of 100 Mile House. Martina Dopf photo. The fire has lots of air support including skimmers (pictured), filling out of Watson Lake and water bombers. Bob Grant photos. A view of the fire from south of 100 Mile House. Martina Dopf photo. Marianne Rumbal took this photo on Friday of the Ashcroft Reserve fire. Taken by Cache Creek resident Darlene Ambler at the Husky Gas station by as she was being evacuated on Friday. Williams Lake resident Donna Ford sent this photograph from the airport on Friday. 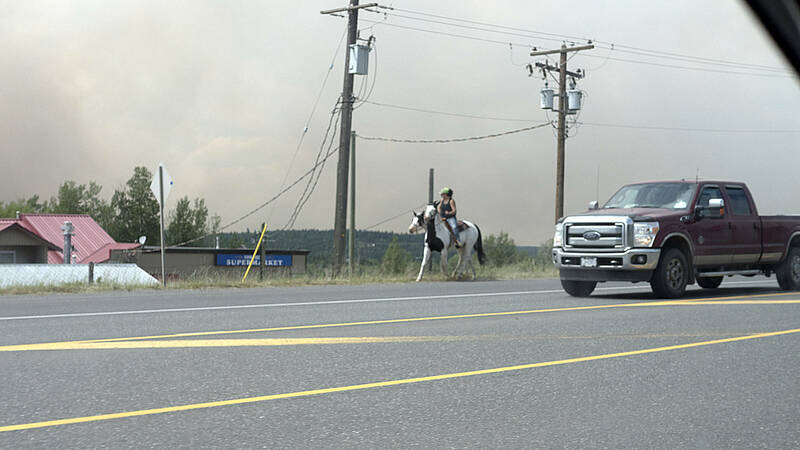 Taken by 100 Mile Free Press editor Max Winkelman, as the Gustafsen fire continued to grow at a rapid pace on Friday. Ashcroft resident Jacob Aie made use of the cell charging station provided by Ken Gilpin on Saturday. In the absence of electricity, Ashcroft-Cache Creek editor Barbara Roden reported that Gilpin used a generator to provide his neighbours with a way to charge their cellphones.